On Jan. 1, state Sen. Mike Shirkey became the most powerful Republican in the Michigan Legislature. As the new Senate majority leader, the Clarklake businessman will now lead the GOP, along with the new House Speaker Lee Chatfield (R-Levering), through a time of divided government following Democrats’ key statewide office wins. The election of Gov. Gretchen Whitmer, Attorney General Dana Nessel and Secretary of State Jocelyn Benson signaled the end of eight years of Republican control at all levels of state government. Shirkey and Chatfield will now have to work with Democratic executives and more Democratic members of state Legislature than before — many of whom are women. In a sit-down interview with the Michigan Advance this month, Shirkey talked about working in a divided government. He noted most laws the Legislature passes are bipartisan. But Shirkey said that defending more controversial measures passed in the last eight years by the GOP-led Legislature is a top priority for his chamber. 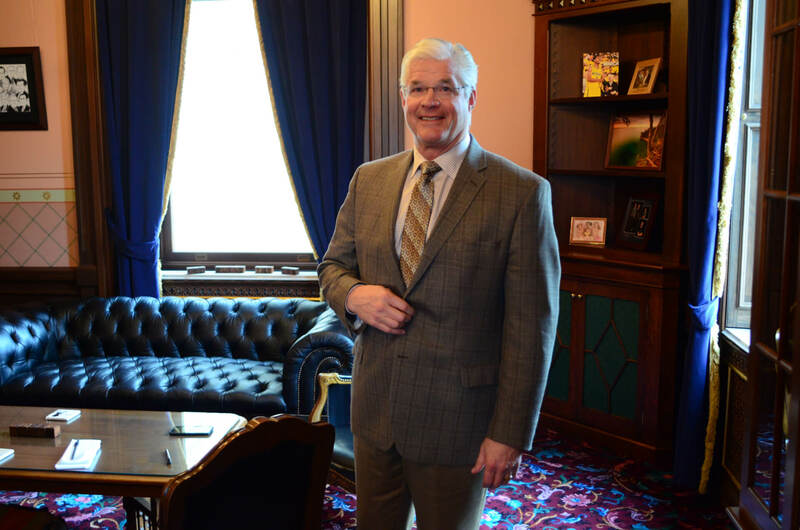 As the Advance previously reported, Shirkey took aim at Whitmer’s string of executive directives, saying that they amount to “signals of philosophy” rather than legally-binding measures. He also said state contractors should “ignore” her equal pay directive, adding he doubts the existence of a wage gap between men and women in the first place. During the interview, Shirkey said he would have implemented Medicaid work requirements on “day one,” if he could have. Michigan Advance: What are some of the first few things that you want to do this session? Shirkey: We’ve already been pretty public, even in my opening remarks on the Senate floor [on Jan. 9] — I think we have not just a responsibility, but an obligation, to reduce auto insurance costs for people across the state of Michigan. Beyond that, we’ve done some surveys with the caucus, today we’re having, actually, a caucus meeting … to establish caucus priorities. I’m of the opinion that I don’t need to, nor should I, get out in front of our caucus. … Now I have some personal priorities, but those are gonna be mixed in with the caucus process. Michigan Advance: What would you like to see with no-fault [insurance]? The House had a push [in Lame Duck]. What do you think of that plan? Did you have something else in mind? Shirkey: So … my strong opinion on this is that all previous attempts to reform auto insurance in Michigan have, in general, been led by somebody who favors one side of the argument or the other. My goal would be to lead our caucus in a process that would go right, straight down the middle. And the ultimate goal would be … what does good look like, as a result? It’s that we affirm a material, measurable reduction in insurance, auto insurance cost to drivers in Michigan. And a likely outcome of that is that all the interest groups associated with it would be equally dissatisfied. Michigan Advance: So everyone’s angry — that’s success in your mind? Shirkey: Well, angry is a little stronger word than I would use. Just equally dissatisfied. Michigan Advance: What do you think about this House plan that came out that would do away with civil asset forfeiture? It looks like there’s bipartisan support. Shirkey: Well, beyond public safety, I can’t imagine another higher priority than helping people protect and preserve their own personal assets. So unless I find out something that I’m not aware of, I think it’s a fine and appropriate top priority. Michigan Advance: So you would support it in the Senate? Shirkey: With what I know today, I would support it. Michigan Advance: In other interviews, you’ve stressed wanting to collaborate with Gov. Whitmer and Democrats, but you’ve also said that you plan on defending Republican laws that have been passed in the past eight years. How do you navigate that tension? Shirkey: Well, first of all, many of the laws — a high percentage, not a majority — but a significant percentage of the laws we’ve passed in the past eight years were with bipartisan support. So they’re not just Republican. I think my statements really reflect us staying on the track that we’ve been on to systematically continue to improve Michigan’s ability to compete in the world. And the results of that are economic prosperity, more hope, more opportunity, more jobs, etc. So, for instance, getting budgets appropriately done and not having them linger throughout the year. With specific regard to a working relationship, I don’t view my governor as an enemy. We are participants in a game called, ‘Let’s make Michigan the best possible place we can for families, talent and jobs.’ And we may have different pathways to get there, but I’m certain that she would fully affirm that be the goal. Michigan Advance: When it comes to contentious issues, there’s disagreement — Right to Work, for example. Whitmer, when she was a senator, did not support that. How do you navigate issues like that? Shirkey: I think it’d be interesting to ask her if she likes the outcome of that vote because it’s undeniable that was one of the last remaining obstacles for the outside world viewing Michigan as attractive. And the data speaks for itself, both in investment and in union growth. I believe just about all unions in Michigan have experienced growth with the exception of the MEA [Michigan Education Association] since Right to Work has been passed. I believe that’s true. Michigan Advance: What are some Republican laws passed in the last eight years you want to make sure you defend? Shirkey: Well, that would be one of them. I’d like to make sure that we maintain the law we just passed this last year on a very thoughtful work requirement for those on Medicaid, making sure that we don’t slip backwards on areas like tax on individuals and on business — particularly on business, because that is one of the biggest things that has contributed to Michigan becoming so attractive to capital. Those are the big things. Michigan Advance: There was a study before this law testing [welfare] recipients for drug use. The results were zilch. Do you see … this new requirement as a sign of distrust of Medicaid recipients? Shirkey: No. I just think that what we’re trying to do here, particularly in this case, specifically Healthy Michigan — that’s the expansion part of Medicaid [under the Affordable Care Act] — giving its best chance to actually survive. Because Michigan is unique in the nation because our language was very specifically crafted so that if ever the cost to the state exceeds the savings that we can measure, the program goes away. So, I think work requirement as an example, is necessary, so that we don’t come up to that point where, or at least extend out to the point — and remember this conversation should be mostly about Healthy Michigan. It was never intended to be a benefit of perpetuity. It was intended to identify and address health-related obstacles prohibiting people from achieving their highest level of personal productivity. It’s a bridge; it’s a gap; it’s a help to get from here to there. And that’s different from what the fundamental Medicaid system was. And that to me causes the need to have these kinds of guidelines associated with it, like work requirements. I’d have done a work requirement day one, if we’d been allowed to. Michigan Advance: Do you see Healthy Michigan mainly as a way to increase and ensure productivity? Shirkey: I see Healthy Michigan as a vehicle in which those that are on the lower end of the income scale or out of work that can be healthy and used to remove health-related obstacles inhibiting or prohibiting them from achieving their highest level of personal productivity. That doesn’t mean they’re all gonna be journalists or they’re all gonna be senators. But whatever their highest level of personal productivity is — what are the health-related obstacles, and lets get them taken care of. Michigan Advance: The governor promised to veto appropriations bills. What do you think about that plan? Will that be a sticking point when it comes to a working relationship between Democrats and Republicans? Shirkey: I think it’ll be a subject of conversation, early on. She’s drawn a line in the sand on that, so we’re not gonna ignore it. Acknowledge it, and we’ll see where it goes. Michigan Advance: You mentioned some personal legislative priorities. What are they? Shirkey: One of our many shortages of talent in Michigan is nurses. And we still today have lots of nurses coming in from out of the state every day to work. Simultaneous to that, we have a demand from health care providers. They want their nurses to have higher level skill sets. In other words, a bachelor’s degree, not just associate’s degrees. I see there should be no problem of offering the ability for bachelor’s degree nursing to be offered by community colleges and try to break the bottle neck there a little bit. The fact of the matter is, the richest source of raw material for bachelors degree nurses are associate degree nurses, and they are all working. And they also are likely to have families, have jobs and have community involvement, and it’s very difficult for them to unplug from that, to have to go to a university. I’d like to see, under certain conditions, community colleges being able to offer bachelor’s degrees in nursing. That’s one of my priorities. Integration of mental and physical health — some people refer to it as 298. I’m disappointed in how far we’ve taken that so far and i think it’s a source of rich savings … particularly in the Medicaid arena. And that, in my mind, remains a high priority. And I guess the third thing I’ll add is, over the last four years in my short tenure, I’ve consistently seen us layer on more and more requirements and regulation in the education field with minimal, measurable positive results. But the one result that we can actually measure is I think they’ve resulted in taking away teacher-student interface time in the classroom. Teachers being required to spend more time record-keeping, testing, and not being able to actually teach. So I’d like us to start looking, an oversight way, some of those things that we’ve done, and are they performing as expected. And if not, let’s see if we can’t empower, free up, some teacher time so they can have more time in the classroom. Michigan Advance: What are some regulations that have passed or rules that might be getting in the way of teacher-student time? Shirkey: For example, we have IRPs, which are independent reading plans, and IAPs [individual accommodation plans] … and 90 percent of them cover the same thing. Yet under current law, particularly in kindergarten, first grade and the lower [elementary] schools are required to do both. Well, if somebody has an IRP, then they probably cover most of what is in the other one. Why do both? That’s a good example. And taking that logic and applying it to other things that we’ve done in education I think is perfectly appropriate in the spirit of oversight. I’d like to know which rules and requirements … reporting is a classic one, that result in nobody reviewing the reports, or the reports resulting in no actionable recommendations. Either one of those — why do them?